Yay, no more scraping our cars. Keeeerrr-crunch! That was the sound of our cars bottoming out in the gutter every time we pulled in and out of our driveway for the last few months. It was a painful daily reminder that I needed to stop procrastinating and find a fix to the steep rolled curb between the sidewalk and street right off of our driveway. Not quite as fun as interior decorating and landscaping which is why the task kept slipping to the bottom of my to-do list. 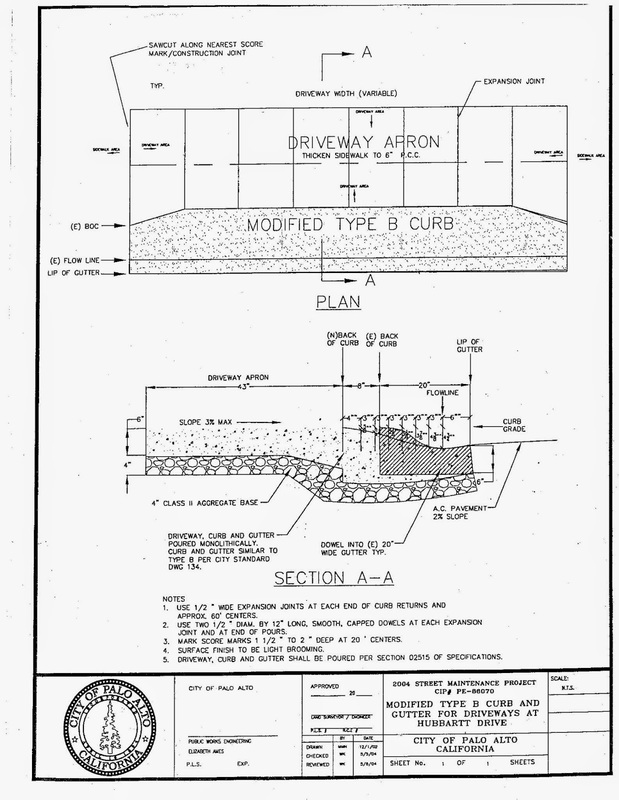 The area between the sidewalk and the curb is called the driveway apron. In our neighborhood most of the aprons are made of concrete with an embedded pipe to allow water to flow through it instead of pooling around the edges. Unfortunately, the pipes get easily clogged by leaves and street debris. Most of our neighbors put concrete in the gutter to make the transition from their driveway smoother. Some of our neighbors have fancier aprons made out of treaded (non-slip) steel plates. These have better drainage. The quote we received for a custom steel driveway ramp was approximately $2000 for 20 feet of gutter coverage. 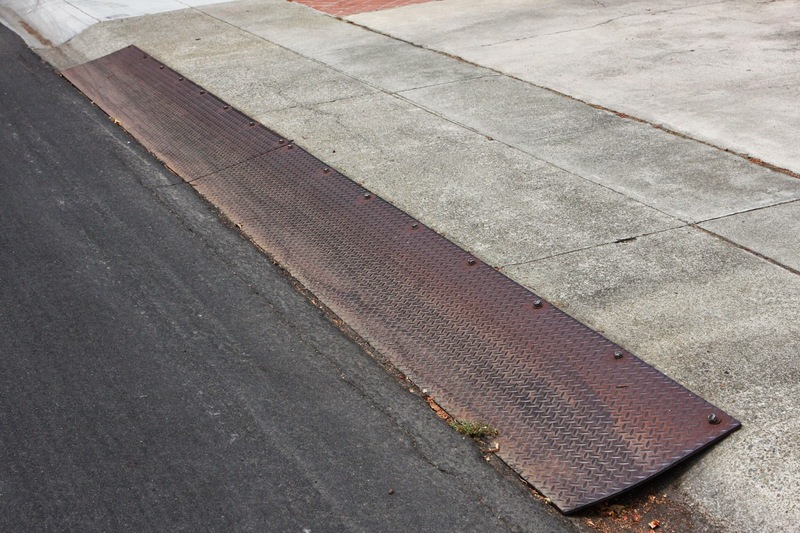 Steel plates bolted into the sidewalk allow more clearance for water to drain underneath. The option we ultimately decided upon was the BRIDJIT curb ramp system. It seemed like the quickest and easiest solution out there and it was relatively inexpensive compared to concrete or steel. They come in 4 foot sections so we ordered the BRIDJIT 3 Piece Curb Ramp Set plus three 48" Center Section Ramps to span across our 23-foot driveway. The total cost was approximately $730 and they showed up in two days thanks to Amazon Prime's free shipping. It's about $10 less if you order directly from the BRIDJIT website but I think it's worth paying a little more for Amazon's no-hassle return policy in case something goes wrong. 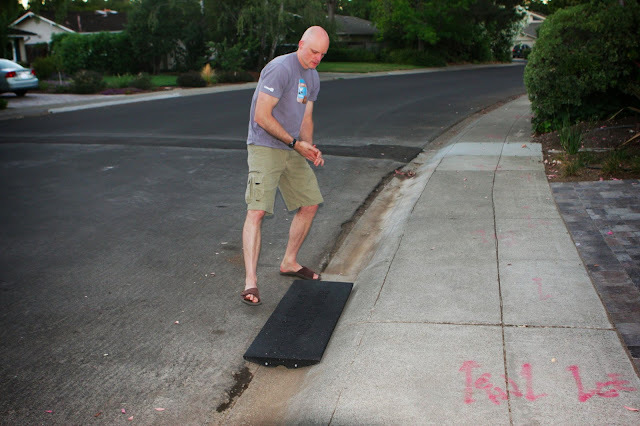 Installing the BRIDJIT ramp is pretty easy, especially if you're pregnant and have a strong spouse who volunteers to do it. 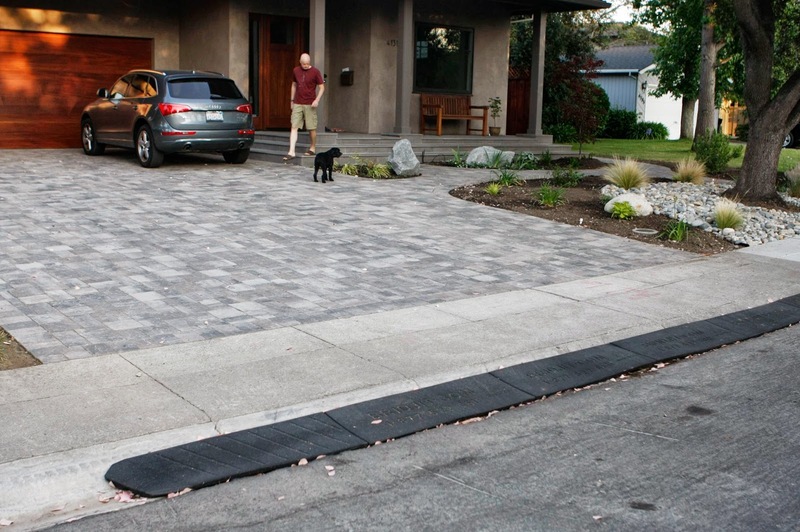 Made out of recycled tires, the ramps have just enough flex to accommodate the curve in our driveway. The ramps get assembled upside down using galvanized bolts (included) to connect the sections together. Once you've attached all the sections you flip the ramp over and position it in the gutter. The weight of the ramp holds it in place so it doesn't have to be bolted down to the curb. We were worried it would move around and slip down the curb but so far we've driven over it many times and it has stayed in place. Bolts connect the sections and a 2.5" groove allows water to flow underneath. As you can see from the photos, leaves and debris do collect under and around the ramp but it's easy enough to lift and clean if you have two people (one to lift a section while the other cleans, or two people to flip the entire ramp out of place). It's a small price to pay for Fahrvergnügen. 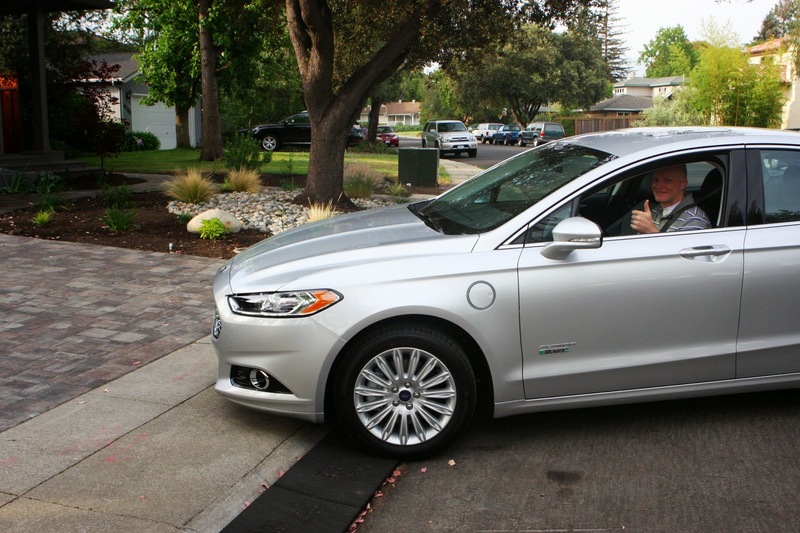 Thumbs up for good ol' American innovation. Our new BRIDJIT ramp kept 24 old tires out of a landfill. Unfortunately, none of these driveway aprons–concrete, steel or BRIDJIT ramps conform to Palo Alto's building standards. 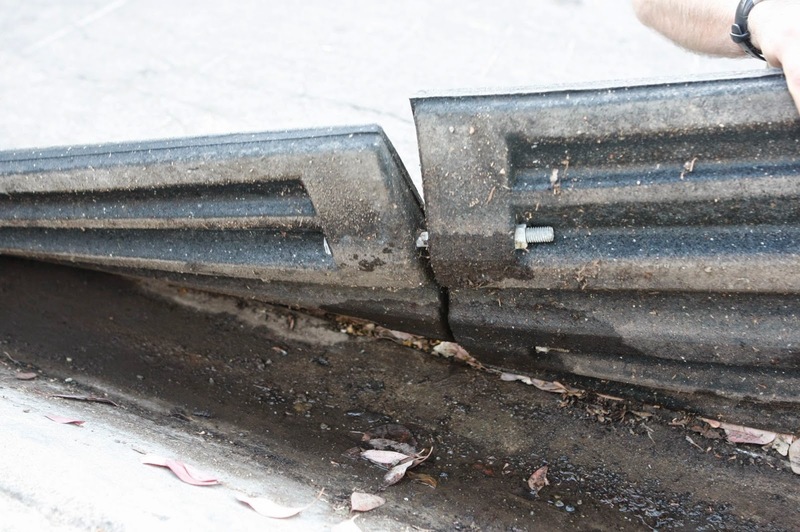 Technically, before you mess with the city's curbs you are required to apply for a permit and have a licensed contractor do the work in accordance with city codes. 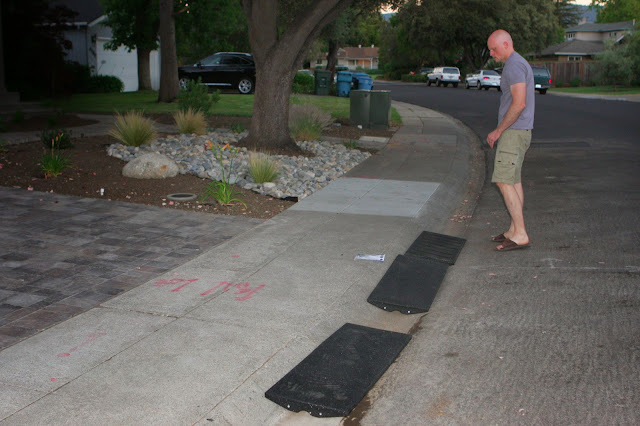 I spoke to a very nice City of Palo Alto Public Works Engineer who acknowledged that most homeowners have modified their driveway aprons without a permit. The city's main concern is drainage, so if they find your driveway ramp is causing any drainage or safety issues they can pull it out without warning or permission from the homeowner. So while he didn't officially bless our rubber ramp, he did concede that it's lower risk since they are less permanent and can be moved easily. 1. Call your city's Public Works Department and inquire about the requirements for your neighborhood. Most cities will not officially refer you to contractors but you can ask them to give you the names of the last dozen or so contractors to be issued Street Work Permits as a place to start. 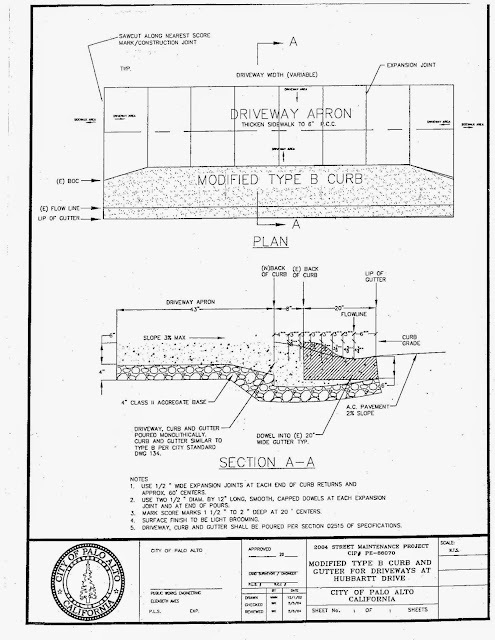 For those of you who are interested, here's the only Palo Alto-approved driveway apron design for our street. [NOTE: Not every street has the same requirements so this does not necessarily apply to all streets in Palo Alto.] The design is fairly cost prohibitive given it involves ripping out the sidewalk along the driveway frontage and a $460 street work permit. One of our neighbors got an estimate of $3200 to do the work. *Ouch. * She ended up opting for the BRIDJIT curb ramps too. 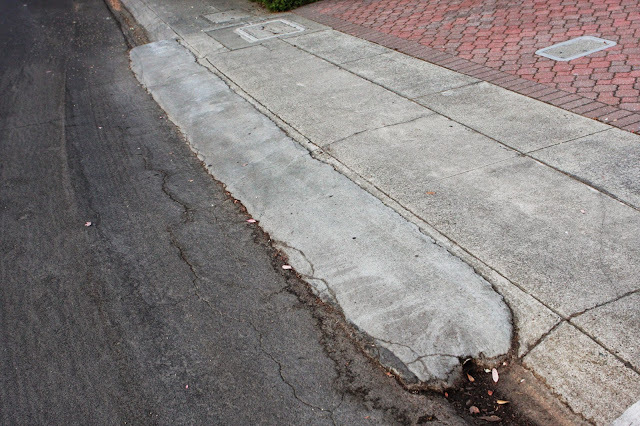 Palo Alto's "Modified Type B Curb" spec. Looking at it makes my head hurt.